Check your emails if you're a Chapters Indigo Plum Rewards member! 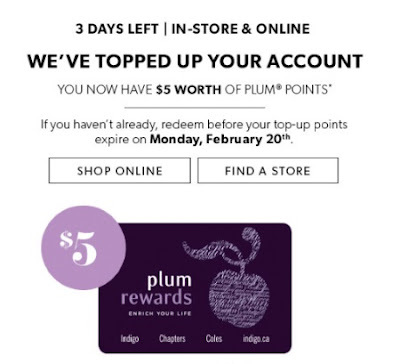 They have topped up select accounts with $5 worth of Plum points! If you got this special offer you can redeem $5 off your next order in-store and online. This offer expires Monday, February 20, 2017.